/ exterior renovation / Coordinating Exterior Home Elements: Match or Contrast? Before you start picking out colors, take a moment to take stock of the exterior elements that you cannot change or at least the ones that have extremely long lifespans. This includes a brick or stone exterior, tile roofing or perhaps a well-designed landscape. While it is possible to paint over brick, it’s not generally a good idea as it takes away some of its natural beauty. It’s easier to change elements like asphalt shingle roofs or siding as opposed to permanent components. Neutral colors can help make permanent elements stand out. However, it may take some trial and error before you find the right one. Once you figure out which elements you can and can’t change, start narrowing down your color choices. Some may consider choosing an exact match between the roofing and siding a bit boring, but it can achieve a certain look if done properly. 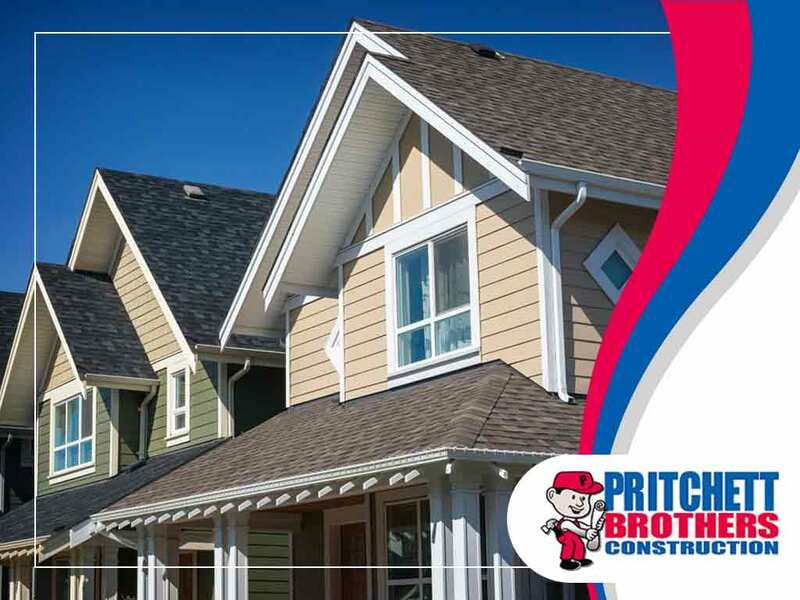 The key to matching the roof and siding is in choosing trim and gutter colors that offset what would otherwise result in a monochromatic color palette. Alternatively, different tones of the same color can add dimensionality without resorting to a single color. Elements with contrasting colors create a well-defined and bold look for your exterior – which is ideal if the surrounding areas are mostly concrete and/or surrounded by greenery. For a red brick exterior, choose roofing with dark shades of blue or green since these colors can add visual weight. When trying out contrasting colors, make sure you obtain physical samples, and do not rely on sketches or digital models. Once you have your samples, place them against the contrasting element, and see how they will look during different times of the day – in the morning, at dusk and in the evening. Once you have narrowed down your color choices, Pritchett Bros can help you with the rest. To learn more about what we can do for your roofing, siding and gutters, call us today at (812) 213-8665. You can also fill out our contact form to schedule a free in-home consultation. We serve Bloomington, IN, and surrounding areas.